Called a "smart light" because you need to use your noggin to put it together. Comes with complete instructions for assembling 30 identical pieces into a sphere as shown in photo. Add a colored bulb to completely change the look of this unique lantern. Also called "puzzle lights," "IQ lights," or "Dream Lights," these fantastic lanterns are made from a special high-temperature plastic that is safe to use with CFL (compact fluorescent) bulbs. 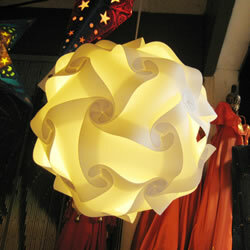 These cool lamps can be assembled in all sorts of different designs. Google "IQ Light" to see how these ingenious lanterns go together.